Blitz Exclusive offers a fleet of premium vehicles to suit all travel needs at any time of the day, covering trips from Venice to Milan, Rome and the main Italian cities and back. Blitz Exclusive’s chauffeur-driven limousine and luxury taxi hire service in Venice is synonymous with reliability, safety and comfort and is delivered through unique, premium vehicles. 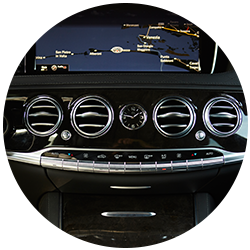 We offer first-rate luxury cars to make your travel experience as comfortable as possible. Chauffeur-driven limousine service from/to Venice Airport Blitz Exclusive offers premium vehicles and qualified staff to provide first-class, bespoke services, especially from/to Venice Airport and city centre, but also mainland and the main Italian cities.